Even though It would be wrong to assume that WikiLeaks knows exactly what its sources are since it’s pretty easy to manipulate, it’s hard to argue that people like Julian Assange and Edward Snowden are doing anything but good things for the world. It’s also made people a lot more aware of privacy, and in particular one’s privacy online. Only a decade ago few people understood what a web cookie was and probably would have assumed it had something to do with eating. Nowadays loads of people are aware and often angered at it meaning a potential disruption of their privacy. Just look at the recent news about the Vivaldi web browser, which was recently accused of meshing spyware into its web browser—and Vivaldi is a company that prides itself on privacy. It turns out that Vivaldi do care about users privacy and CEO Jon von Tetzchner says the whole debacle is because it was them who once criticized Google about privacy, so they retaliated. That, among other things, has eventually lead to Microsoft announcing that they wish to be “fully transparent on the diagnostic data collected.” As of Windows 10 build 17083, we are now officially starting to see that happen. When Windows 10 first arrived several years ago now there was a setting in the Enterprise edition that allowed users to disable telemetry if they wanted—that’s the edition of Windows 10 that is made for corporations, companies, businesses, but isn’t the kind of edition that you would expect to find on a laptop around the home. Those editions of Windows are usually Windows 10 Home and Windows 10 Pro: editions that only offered settings that users could choose from (Basic, Enhanced, Full—or just Basic and Full since the Creators Update—), but nothing available for disabling and enabling the telemetry. Many Windows 10 users felt that it was going against their privacy by not documenting precisely what information each setting is collecting regarding data from the user’s computer. Since the birth of the Windows 10 Creators Update, Microsoft has started to publish what it’s default “Basic” setting of telemetry collects, the first real move they have made to help ease concerns people were having about privacy with regards to these settings. Now starting from Windows 10 build 17083 you can check out all the data that Windows sends to Microsoft directly from the Settings application. The option isn’t turned on by default, but if you want it, you can have the Windows 10 Diagnostic Data Viewer working in your favor—an entirely new application that shows Telemetry (diagnostic) data and all the data even the most privacy-conscious person could ever wish for. A privacy aficionado’s dream. A privacy addict’s drug. A privacy-a-holic’s . . . you get the idea. You then get a “Diagnostic data viewer” button located directly beneath the toggle that you just turned on. 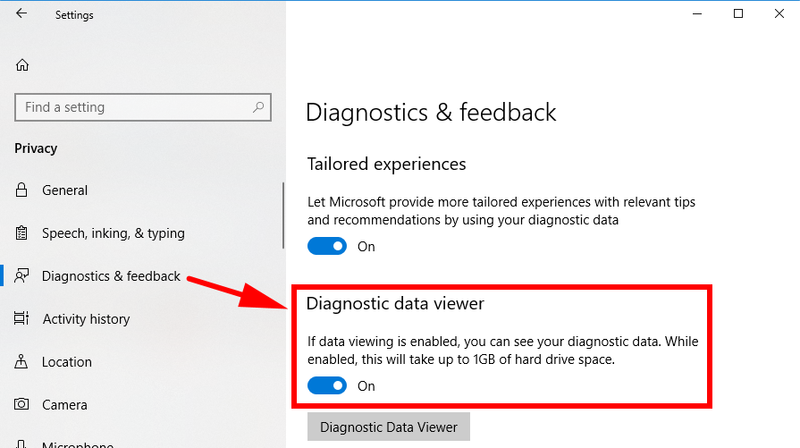 Clicking it takes you through to the Microsoft Store where you can then download the Diagnostic data viewer application. Click on the “Get” button and then wait a few minutes for the notification to appear in the bottom right corner of the computer’s display for you to launch the app when it’s ready. If you miss it, then you can always click on the “Action center” icon from the system tray in the taskbar and find the notification that way as well. 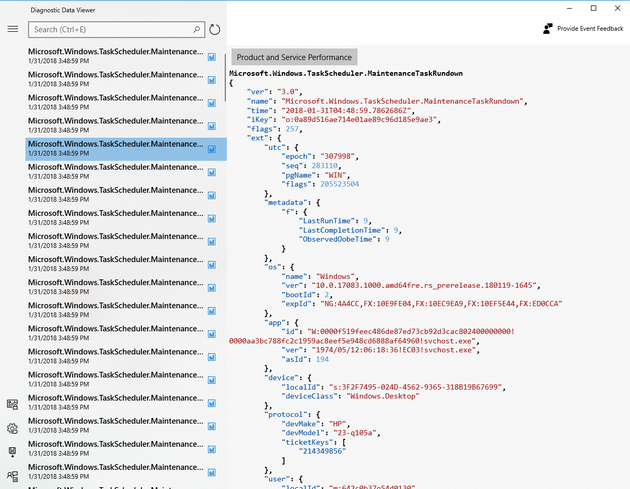 Microsoft was also kind enough to fill us in on exactly what kind of information you can expect to find from the Windows Diagnostic Data Viewer application as well. The list includes what applications are installed on the computer, the device’s ID, the version of the operating system, the device’s overall health and other data that helps with understanding the performance, how the applications and services are being used, any errors and error messages, browsing data from the Microsoft Edge web browser, and the device properties and capabilities. As you can see there was never anything of any real substance to worry about, which is likely the reason why Microsoft didn’t bother showing the information in the first place. But there was no real way of knowing that until they showed us. And now that everything is out in the open, there will be no more privacy concerns going forward with future Windows 10 updates. It’s not exactly information that everyone needs to see, and it’ll achieve little other than crowding the operating system and creating extra confusion if it were to be made available straight up for everyone, but if you want it the application is available for you to get from the Microsoft Store by using the Settings application as shown above.